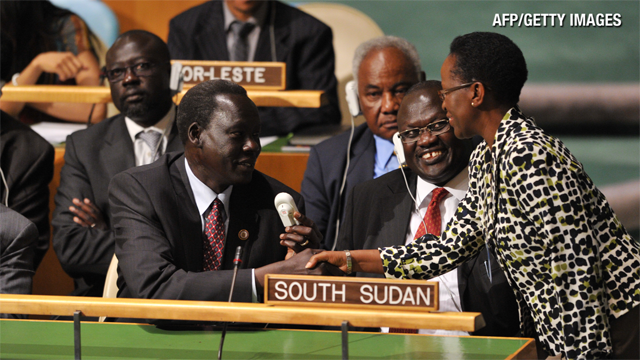 (CNN) -- South Sudan officially became the 193rd member of the United Nations on Thursday morning, capping a flurry of activities that started with its independence last week. The United Nations Security Council recommended the world's newest nation to the General Assembly on Wednesday. The General Assembly acted on the council's recommendation Thursday. "We look forward to the Republic of South Sudan joining us as a member of the United Nations and to working closely with its representatives," Guido Westerwelle, the foreign minister of Germany, said in a statement Wednesday. Germany is leading the Security Council this month. South Sudanese celebrated their independence Saturday in a boisterous ceremony attended by world leaders, including Ban Ki-moon, the U.N. secretary-general. South Sudan's sovereignty officially broke Africa's largest nation into two, the result of a January referendum overwhelmingly approved by voters. The referendum was part of a 2005 peace deal that ended decades of civil war pitting a government dominated by Arab Muslims in the north against black Christians and animists in the South. Ban urged north and South Sudan to work together, and said the United Nations has a crucial role to play in their success. Meanwhile, the Sudan parliament has given preliminary approval to revoking citizenship of South Sudan nationals, according to SUNA, the state news agency.